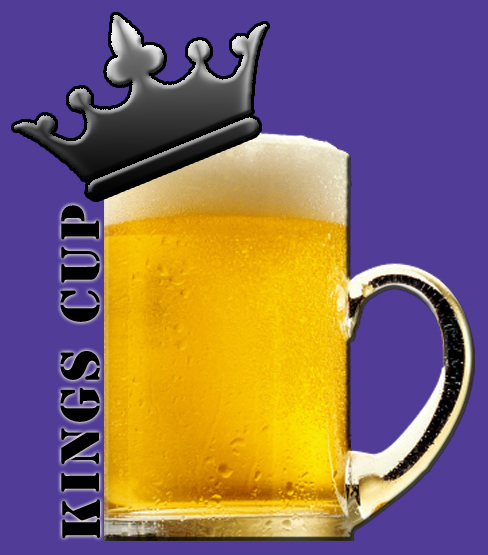 There are many different variations of playing Kings Cup / Circle of Death, but the rules are essentially the same . I'm going to give you the basic rules I have used since I first started playing. In Kings Cup, an empty cup is placed in the center of the table along with entire deck of cards spread out evenly around it in a circle. Going clockwise, players draw cards from the circle. When a King is drawn from the circle of cards, that player must pour whatever it is they are drinking into the center cup. Any other card drawn must follow the actions stated below. The game is over when the fourth King is drawn, in which case the person who draws the 4th King must then drink the middle "King's Cup" no matter what crazy concoction it may hold. right of the person who drew this card, you cannot stop drinking until everyone at the table has stopped. Once the card is shown, everyone playing must touch either the table or the actual floor with their hands. The last player to do so must drink. Once the card is shown, everyone playing must put both hands in the air. The last player to do so must drink. The player that drew this card picks someone else at the table that must drink every time they do until another 8 is drawn. The player who drew this card says a word. Then the player to the left of them must think of a word that rhymes with the one spoken, within a reasonable amount of time (5 seconds is usually the max). This keeps going around until someone can no longer think of a rhyming word, in which case they have to drink. All players put up three fingers. Going clockwise, starting with the player who drew the card, players say things that they have never done. If someone at the table has done what is stated, then they must put a finger down. The person who runs out of fingers first must drink. The player that draws this card makes up a rule that has to be followed through out the rest of the game. This rule can be anything from "No Cussing" to "Taking the Little Man Off"(if you don't know, look it up) and must be followed or a drink must be taken. The only way of getting rid of a rule is if someone else pulls a Jack and uses it to declare the old rule is no longer in effect. There are a few ways of playing this card, but the most popular is to have the person who draws the Queen become the Questionnaire. From the point in which this card is drawn onward, if the Questionnaire asks anyone a question and gets an answer, the player who answers the Questionnaire must drink. This continues until another Queen is drawn, in which case that player now becomes the new Questionnaire. Either pour whatever you are drinking into the middle cup or, if it is the 4th King, you must drink whatever concoction lay in the cup in the center. *If you don't want to play with a cup in the middle. You can use the King as a "Category" card in which case the person who draws the card comes up with a category, like "Types of Guitars". Then, it goes around clockwise, until someone can no longer think of something pertaining to the category and must drink.